Fed Watch: Rushing to the Exits? HomeBusinessFed Watch: Rushing to the Exits? Today’s Federal Open Market Committee statement included a nuanced tip of the hat to hawks on the central bank’s policy making committee who think the Fed is putting too much weight on the argument that the economy’s substantial slack will drive down inflation. Slack is the economy’s productive capacity that doesn’t get utilized — unemployed workers, empty hotel rooms, unsold homes, idle factory floors, etc. When there’s a lot of slack, it puts downward pressure on prices in the short-run. It’s one very important reason why the Fed has felt comfortable assuring markets that it is likely to keep interest rates exceptionally low for a long time. Because slack is likely to keep inflation low, the Fed will keep rates low. The practical implication of this little wording change? Keep an eye on measures of inflation expectations, such as inflation-protected Treasury bonds and University of Michigan surveys of consumers. They have been stable. 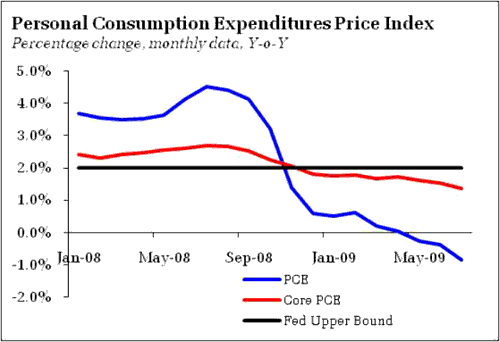 But if they start rising, the Fed’s inflation view could change and tilt it toward a more hawkish stance. I was not planted here at my work station yesterday but roaming through the myriad of emails I receive it seems that one of the reasons for the weakness yesterday was a report by an advisory firm, Smick Medley, that the Federal Reserve at its upcoming meeting would comment on and discus raising rates sooner rather than later. Crude oil declined for a second day in New York after a U.S. government report showed a larger-than- expected increase in fuel stockpiles in the world’s largest energy-consuming nation. Gasoline stockpiles in the U.S. surged 5.4 million barrels last week, the Energy Department said. That’s more than the 500,000-barrel increase forecast in a Bloomberg News survey of analysts. Diesel and heating oil inventories jumped 2.9 million barrels, double what was expected. Crude oil supplies climbed 2.86 million barrels last week. In recent months, we have argued that the zero lower bound (ZLB) on nominal interest rates represents a meaningful constraint on monetary policy in particular and economic policy in general. Specifically, combining a variant of the Taylor Rule for monetary policy with our forecast for growth and inflation, we have long concluded that the Federal Open Market Committee (FOMC) would want to push its target for the federal funds rate significantly below zero – to levels of -6% or lower – if it had that option. The -6% number suggests a much, much more aggressive expansion of the balance sheet, while the Fed in contrast is willing to let the current programs play themselves out over the course of the next six months. Federal Reserve policy makers are concerned about making “a colossal policy error” leading to higher inflation if they don’t withdraw extraordinary monetary stimulus soon enough, said Laurence Meyer, vice chairman of Macroeconomic Advisers LLC and a former Fed governor. The Federal Reserve and U.S. Treasury said they’re scaling back emergency programs aimed at combating the financial crisis, reducing support for firms that now have an easier time getting funding. The central bank today said it will further shrink auctions of cash loans to banks and Treasury securities to bond dealers, reducing the combined initiatives to $100 billion by January from $450 billion. The Treasury has “begun the process of exiting from some emergency programs,” the chief of the government’s $700 billion financial-rescue fund said separately. Bottom Line: The Fed is moving toward the exit as they look toward the conclusion of their securities purchases programs. 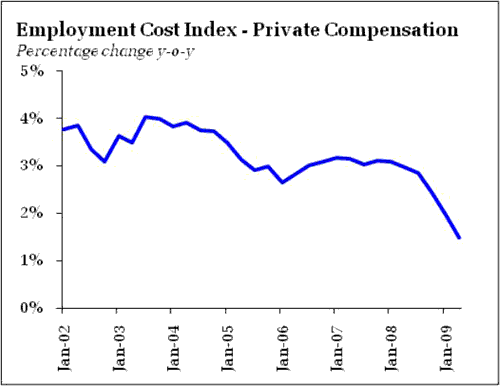 But it is not clear that such a move is justified by their own forecasts or the inflation/wage/employment data. There may be an internal fear they have gone too far, a fear that the hawks can exploit. To be sure, I see no reason to expect the Fed will raise rates for a long time. And the Fed maintains it policy flexibility, claiming to be ready to revive asset purchases should economic or financial conditions justify. But I now suspect the bar for renewed expansion of Fed accommodation may be much higher than I had anticipated. 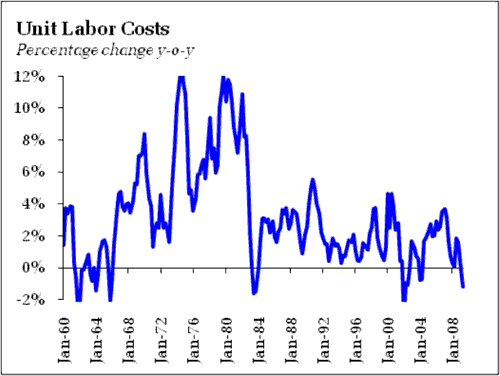 And that the dominant push for expansion would have to come from financial market conditions, while they would be willing to tolerate persistently high unemployment rates so long as U. Michigan inflation expectations say elevated, regardless of the actual inflation data.